Visit temples, churches, market places, traditional dance and martial art schools and ayurvedic medicine centres. Take a canoe ride through the Kumarakom Bird Sanctuary. Experience how coir making is done. 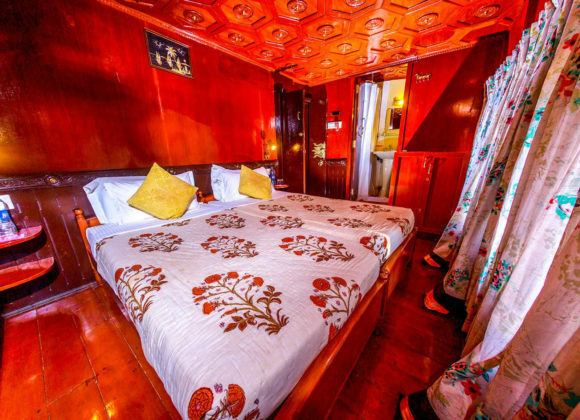 A really delightfully tropical river cruise on warm waters with a lot of sun bathing and lazing as you sail towering twenty feet above the paddy fields in canals held together by dykes or, along the Arabian Sea where the setting sun splashes the endless waters with a bright orange glow. This morning we arrive in Nettoor village in Cochin to watch Kalarippayattu-the traditional martial art said to be the birth of all martial arts including Karate, at an authentic training centre-Kalari. Drive to the nearby village Marad and embark on our boat by noon. The team on-board welcome you to the boat and help you with smooth check-in. Gather at the lounge for a briefing about the boat and about the cruise. Unwind, as the boat leaves behind the rapidly growing city and gently cruise through the interconnected rivers, lake and coastal estuaries. We pass by the interspersed islands surrounded by coconut trees. Enjoy the traditional lunch and relax on-board. Our expert will talk about Cochin, the Queen of Arabian Sea, and its geographical, cultural and social significance. We arrive in the ancient village Vaikom by evening. By tuk-tuk or by foot we proceed to the ancient temple of Shiva. We take a walk around the temple to get to know about its history and architecture. The architecture of temples in Kerala is based on ancient science of construction and geographical features of the land. As per the traditional architecture, the each element of temple represents an element of human body, and, a temple is not only the space for spiritual enlightenment but also the venue for harmonious social networking. Return to boat. After dinner, we retire for the night. After breakfast on the boat, by tuk-tuk or by foot we proceed to the cultural centre in the locality to watch the traditional dance performance – Kathakali, the traditional dramatic and mimetic dance form, which plays stories from epics. It is a unique blend of dance, music, action, literature and make-up. Cruise to Chenganda village. The people of this rustic village are having a laid-back and peaceful life. Spend time with the coir weavers, the shell harvesters and farmers, engaging in conversation about the riparian life and watching various indigenous techniques of fishing. Return to boat for lunch. Cruise to the expanses of lake Vembanad experiencing its wetland ecosystem. We visit a farm house by evening. 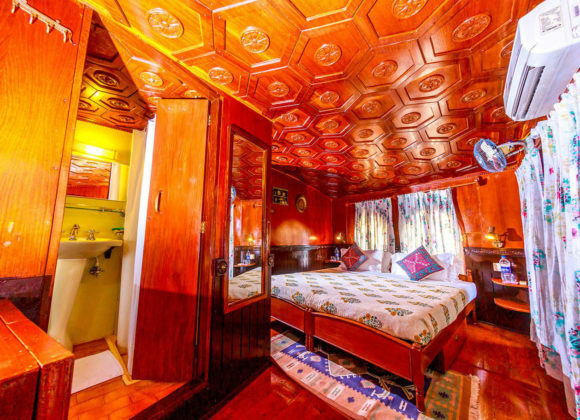 This house is located on an island which was made by the men of the house, by reclaiming land from Backwaters. A walk in the farm will be educative. The hostess will demonstrate the preparation of traditional Syrian Christian cuisine. You may also try your hand at cooking and listen to the story of her family, of three generations of hard working men, and equally strong women who supported their pioneering spirit. We will have dinner at this house. Return to boat and retire for the night. Having an early and light breakfast, we set out by country boat to watch the migratory and endemic birds of Kumarakom, which is a cluster of lagoons of lake Vembanad, at the backdrop of mangroves, paddy fields and coconut groves. Waterfowl, cuckoo, owl, egret, heron and the water duck are some of the endemic species seen here. Parrots, teal, larks, flycatchers, wood beetle, and other birds are seen here during their respective migratory seasons. Return to the boat, refresh and while cruising elaborate breakfast will be served. While cruising the lake we get a glimpse of the rich wetland ecosystem of Lake Vembanad. While cruising, have lunch onboard. We arrive in Kavalam where river Pampa reverses its course and drain into Lake Vembanad. You may take the ferry to explore the region, walk along the dykes surrounding the expanses of paddy fields and interact with the farmers and women’s collective. 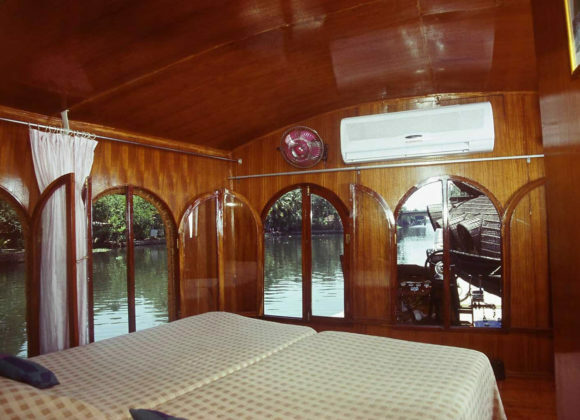 Return to the boat and cruise till dusk, further interior to Veliyanad village. After dinner retire for the night. After breakfast we cruise to Kainakari.We visit the ancestral home of Saint Kuriakose Chavara which is now preserved as a museum. Saint Chavara, the first canonized Catholic male saint of Indian origin, was the co-founder of the first congregation for men, the Carmelites of Mary Immaculate-C.M.I., and of a similar one for women, Congregation of the Mother of Carmel-C.M.C. Return to boat. After having lunch on-board, cruise to Pulinkunnu village. Get closer life along the way, paddling along narrow canal by country boat, interacting with the villagers. Return to boat. After dinner retire for the night. After breakfast, cruise to Nedumudi. On arrival at Nedumudi we drive through the quaint and scenic villages to Mannar which is famous for bell metal and brassware crafts. We interact with the artisans and watch the indigenous method of casting of traditional lamps, utensils and ornate locks. Return, refresh and have lunch and relax on-board. We cruise to Champakkulam village. Kerala’s old spice trade used to pass through this town en route to Cochin and other ports on the west coast. Settled more than 1000 years ago by Syrian Christian traders, who later converted to Roman Catholicism under the Portuguese, the people chose to keep their syncretic cultural heritage. This can be seen in the monumental St Mary’s Church on the riverside. We visit the old church, a school, the local artisans (open on weekdays) who skillfully and passionately craft biblical heroes. Take a look at the Snake boat (Chundan Vallom) of the villagers, gracefully docked on the shore. 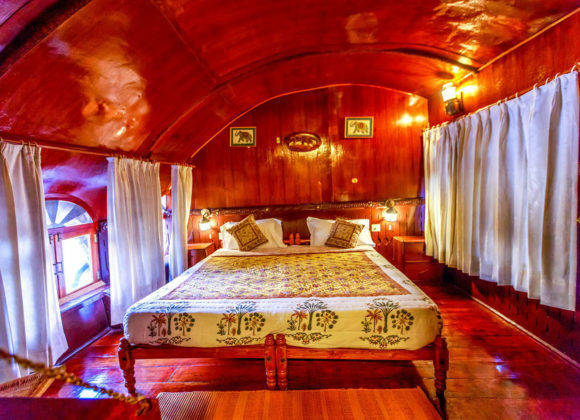 These types of boats, which are being used for races today in modern days, were once maritime war boats and their structure and design reflect the prowess of ancient Kerala architecture and are one of the icons of Kerala culture. Cruise to Changankary village till dusk, passing through the serene canals. You may relax on board or take a walk. After dinner retire for the night. .
After breakfast disembark at Changankari.